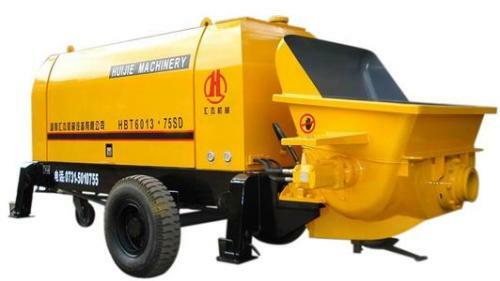 The concrete pump is composed of a pump body and a delivery pipe. It adopts a triple-pumping pump system, the hydraulic circuit does not interfere with each other, and has the function of anti-pumping. Look at the performance characteristics of the concrete pump below. 1, the use of three pump systems, hydraulic circuits do not interfere with the operation of the system. 2. With anti-pumping function, it can help to eliminate plugging faults in time, and can stop for a short time. 3, the use of advanced S pipe distribution valve can automatically compensate for wear and tear, good sealing performance. 4, the use of wear-resistant alloy glasses and floating cutting ring â€š long service life. 5. The long stroke material cylinder extends the service life of the material cylinder and the piston. 6, the optimized design of the hopper â€š easy to clean â€š suction material performance better. 7, automatic centralized lubrication system to ensure effective lubrication of the machine during operation. 8, with remote control role, operation more safe and convenient. 9. All parts and components are all using the national standard and have good interchangeability. CNC fiber laser cutting manchine is cutting-table structure designed machine with dual drive, effctive cutting range is from 1500mm to 6000mm. High-precision longitudinal and transverse linear rails drive high-precision helical gear and rack and it is available in speed up to 8000mm/min. Accelerated speed is 1G. Exchanging work tables are optional that optimize cutting productivity. of different sheet metal cutting table below (for reference).